Edmond P. Abood, 78, a retired Army Colonel who received the Distinguished Service Cross for heroism in the Vietnam War and later did extensive contracting work for the Defense Department, died June 19, 2005, at a hospital in Boca Raton, Florida. He had cancer. Colonel Abood joined the Army in 1944 and was a combat rifleman in Europe during World War II. Later, he was a combat infantry commander during the Korean War and an Army Rangers instructor. In the early 1960s, he had a role in changing the 101st Airborne Division from a parachute infantry division to a helicopter-borne assault division. He served three combat tours in Vietnam, where he commanded three battalions of the 101st Airborne. His Distinguished Service Cross, the highest award for bravery after the Medal of Honor, came for his heroism in action August 13, 1967, when he was commanding an airborne infantry battalion on a helicopter assault mission far into enemy territory. He directed that the helicopters fly low, risking heavy ground fire to make direct strikes against enemy targets. Several helicopters were shot down, and his craft suffered hits. But he and his men landed at the designated place. On the ground, he moved to avoid sniper fire while directing a team to extinguish a fire started by a smoke grenade in nearby elephant grass. He ignored enemy machine-gun fire and shrapnel to evacuate a soldier suffering from smoke inhalation and another overcome by heat exposure. Through the night, he continued to repel enemy forces and direct a move to safer ground -- all the while exposing himself to enemy fire and rallying his men. His other awards included four awards of the Legion of Merit, two awards of the Bronze Star, the Purple Heart and eight awards of the Air Medal. In 1999, he was inducted into the Army Rangers Hall of Fame. Edmond Peter Abood was born in Brooklyn, New York, to Lebanese immigrants. He was a 1950 graduate of Pennsylvania Military College, where he was co-captain of the football team. He also boxed and played football for the Army after Korean War duty. 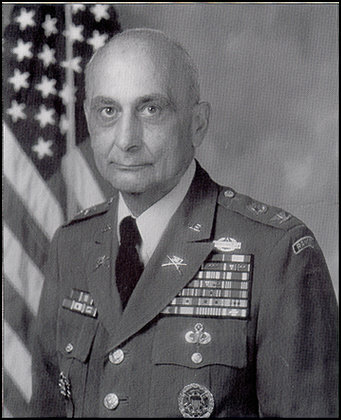 He also was a graduate of the Army Command and General Staff College and the Army War College. His post-Vietnam service included an assignment to the NATO international staff. He represented the alliance in negotiations with the Warsaw Pact in Vienna to reduce conventional military forces. His final active-duty assignment, in 1981, was with the Joint Chiefs of Staffs as chief of the European division. This portfolio included policy, plans and operations affecting U.S. troops in Europe. In retirement, he was a contract employee working for the undersecretary of defense for policy from 1982 to 1998. He was responsible for developing policy and providing advice on operations in national reconnaissance, covert action and psychological operations. He also was responsible for Defense Department support of Radio and TV Marti, which transmit anti-Castro broadcasts to Cuba. He was a recipient of the Secretary of Defense Medal for Outstanding Public Service, an award rarely bestowed on contractors. He was a Fairfax City resident and at his death was visiting his only immediate survivor, a sister, Lorraine Azrak of Boca Raton. The Distinguished Service Cross is presented to Edmund Peter Abood, Lieutenant Colonel (Infantry), U.S. Army, for extraordinary heroism in connection with military operations involving conflict with an armed hostile force in the Republic of Vietnam, while serving with Headquarters and Headquarters Company, 2d Battalion, 327th Infantry, 1st Brigade, 101st Airborne Division. Lieutenant Colonel Abood distinguished himself by exceptionally valorous actions on 13 August 1967 while serving as Commanding Officer of an airborne infantry battalion on an airmobile assault mission deep in hostile territory. During the assault, Colonel Abood flew low through heavy ground fire to mark the landing zone and direct air strikes on enemy positions. Several helicopters were shot down and his craft received numerous hits, but he continued to brave intense Viet Cong machine gun fire until all elements had landed. Once on the ground, he moved through sniper fire to designate defensive positions to his men. A smoke grenade set the dry elephant grass in the area ablaze, but he exposed himself time after time to withering volleys to organize fire-fighting teams and stop the approaching flames. A short time later enemy tracers started a fire around his artillery position on an adjacent hill. Completely ignoring machine gun fire and flying shrapnel, he moved to the position to direct evacuation of his men. He single-handedly rescued a man overcome by the heat and carried him to safety. Throughout the night he moved along the perimeter fully exposed to enemy fire to direct his men in repelling repeated hostile probes. Mortar rounds and rifle fire struck all around him, but he remained in the open encouraging his men. In the morning he directed infiltration operations of his men to a more secure area. Throughout the evacuation he constantly remained exposed to persistent sniper fire all around him. His courageous actions and leadership prevented loss of men or equipment to the insurgents. Lieutenant Colonel Abood's extraordinary heroism and devotion to duty were in keeping with the highest traditions of the military service and reflect great credit upon himself, his unit, and the United States Army.